WILL TECH DISRUPTION DESTROY YOUR SHARE PORTFOLIO? We have already seen how the rise of the internet destroyed the print media sector. Over the last decade, newspaper and magazine companies have shrunk as online publishers captured their readers and enticed away their advertisers. Since 2012, Google’s advertising revenues have been larger than the advertising revenues of all US newspaper companies put together. The recorded music industry has suffered even more pain. Over the last decade, the impact of music streaming (and some piracy) – Napster, iTunes, Spotify – slashed CD sales by 84%. In the long run, of course, share markets will reflect how technological change affects the economy. In 1900, the largest companies on the US and UK share markets were the railways, because these companies had made colossal investments in tracks and rolling stock over the previous half-century. In both countries, the railway sector accounted for more than half of total market capitalization in 1900. Eventually, as cars became more popular, the railways were superseded by the auto manufacturers (such as General Motors) and the oil companies (such as Standard Oil of New Jersey, the ancestor of Exxon). But the auto manufacturers were in turn overtaken by newer industries. The rise of computers and telecommunications meant that by 1967 the two biggest US companies were IBM and AT&T. In 2018, the biggest five US companies are all tech giants – Apple, Alphabet (Google), Microsoft, Amazon, and Facebook. But the changes described above took place over decades. They are changes in the structure of the underlying economy, which are reflected in the composition of the share market. Global share markets are also subject to many shorter term fluctuations, which are usually not permanent. The dotcom boom of 1999-2000, for example, was a bubble led by the tech sector, but most of the tech stocks in that boom did not survive the eventual crash. Looked at in this light, it is clear that the tech giants have had more impact on the share market than they have had on the economy. Although we may use our iPhones to shop online, most of our daily lives have not changed much. We still drive cars, watch TV, drink beer, get sick, build new houses, get loans from banks, etcetera, etcetera. The fact the tech sector has grown to make up a quarter of the S&P500 Index tends to overshadow the equally obvious fact that three-quarters of the Index is not tech. 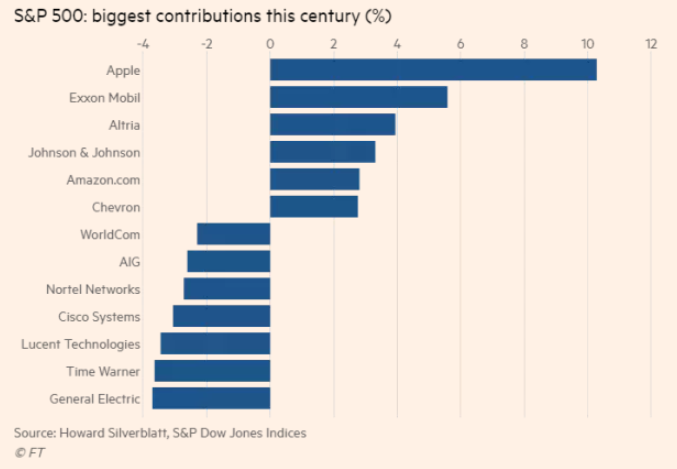 If we look at returns from US companies since the dotcom boom, some tech stocks have provided some of the best returns, but other tech stocks have provided some of the worst returns. S&P Dow Jones Indices calculated the biggest positive and negative contributors to the S&P500 over the seventeen years since 2000. As the chart on the next page shows, Apple is the biggest contributor. But the next five biggest contributors include two oil companies, one fairly low-tech pharma company, and a tobacco company. This is not a phenomenon unique to the US. The charts overleaf show similar calculations for the UK and Japanese share markets. 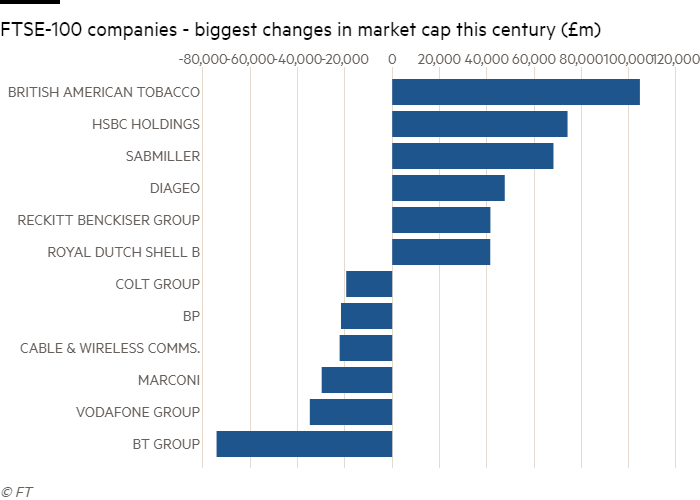 In the UK, the leader is a tobacco company, closely followed by a bank and two liquor companies. 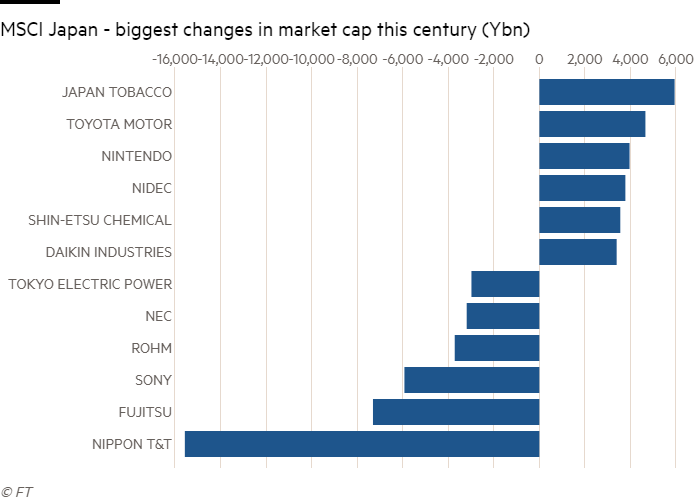 In Japan, another tobacco company tops the rankings, followed by a car manufacturer and a videogame company. What these calculations show is that investors tend to place too much importance on recent history, and not enough on medium and long term trends. Events which have just happened tend to loom larger in our minds than the lessons that can be learned by looking at history. This is the reason why Arminius makes its investment decisions on the basis of quantitative models that use as much historical data as we can get. In the case of the US share market, our data goes back to 1871. For most other developed markets (including Australia), the data goes back to 1900. Only by looking at the long sweep of historical trends can we hope to tell the difference between a lasting change and a storm in a teacup. So the answer to our initial question is straightforward. Disruption will damage your share portfolio only if your holdings are concentrated in one or two sectors. A diversified portfolio will not be much affected. One of the simplest ways to achieve diversification is to hold an index ETF, because the ETF will be continually re-balanced to match the changes in the underlying index. It may seem strange for an active manager to recommend using index ETFs. But Arminius always recommends that its clients use the cheapest tool which is fit for the purpose. We ourselves use index ETFs from time to time in the funds that we manage, if there is an ETF that suits our purposes, so we recommend that our clients should do the same.